This entry was posted on August 13, 2014 by B4S. For anyone working in a Call Centre environment the headset is your best friend. Call centre workers are paid to spend unfathomable amounts of time or the day (or night) on the phone. In these busy, noisy and sometimes stressful workplaces it is imperative that the most used piece of equipment perfectly complements your business practices, your ergonomics, your personality and your style. This means that you need a useful, comfortable, durable, versatile and aesthetically pleasing headset which delivers good audio quality. Now, there are many headset manufacturers out there producing really high quality headsets which can make your job all the easier, make you more productive, increase efficiency and just make you more happy in your workplace. Here we look at our Top Ten Headsets for Call Centres based upon our experience and your feedback. Whilst this is primarily aimed at the user themselves the person responsible for actually providing the headsets will have the final say in most cases. Hence, as in many situations in life - if you don't ask you don't get - so if you are dissatisfied with your headset - tell someone. Of course some people may have their personal favourites, if we have missed any special ones please tweet us at @best4systems with your thoughts. 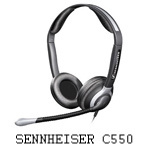 The CC550 headset from Sennheiser is a Binaural set of headphones, with an ultra noise cancelling microphone which cuts out background noise allowing the operator to concentrate fully on the conversation in hand. The Active Guard technology protects the wearer from loud noises and the large and comfortable leatherette pads make these a real joy to wear. 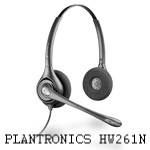 The Plantronics HW261N headset is the first of our headsets from the big daddy of business headsets. Plantronics have an unrivalled pedigree, having had their headsets used in every one of NASA's space missions to date. The 261N has long been a favourite amongst call centre workers due to their ease of use, comfort and brilliant audio capabilities with Wideband Audio for richness of sound and noise cancelling for protection. 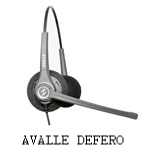 These headsets are also famed for their durability; meaning a lower total cost of ownership for the call centre procurer. 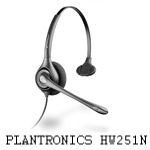 The Plantronics HW251N headset is our choice of Plantronics' best monaural headset for call centre staff. The noise cancelling microphone is perfect for a busy workplace as it actively cuts out background sound - it connects via a DA45 adapter to IP softphones and other communications platforms. 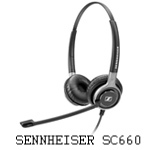 The Sennheiser Century SC 660 Has been hailed as the ultimate call centre headset. Sennheiser are renowned for their high quality and attention to detail so anyone buying a SC660 can be assured that this will fit the bill in all ways. Sennheiser's patented ActiveGuard™ offers high acoustic protection, the sound is just amazing and the cables are even protected with Kevlar casing. These are not cheap headsets but you are buying top end products when you buy Sennheiser. 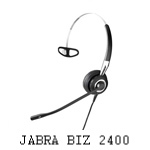 The Jabra Biz 2400 is an award winning and top of the range headset which is built with gold contacts, surgical steel and Kevlar. 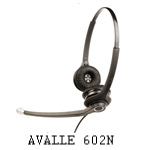 Apart from being beautifully made and giving high levels of comfort, sound and protection this headset is convertible to account for differing wearing styles - behind the head, over the head ( normal ) and over the ear - this sort of touch can be great for anyone who wears a headset all day at work. Although most business call centre operators will prefer a binaural headset there are environments where a monaural headset can be preferable. 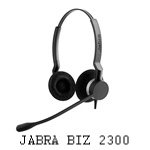 The Jabra Biz 2300 headset has been specifically designed for the call centre operator with quick disconnect and a 360° boom arm with a Kevlar cord. It boasts extremely comfortable leatherette foam ear cushions and simple to use controls on the cord which allow you to answer and end callas as well as adjusting the volume or muting the conversation. This headset won the prestigious Red Dot Design Award in 2014 as well as the IF Product Design Award. 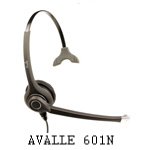 Needless to say this is a top of the range headset, compatible with all leading telephone systems and giving a superb user experience. The Avalle AV601N is one of our monaural choices for the call centre professional as it performs so well in that environment. Like other models from Avalle it matches the premium labels for quality of build and performance whilst being at a far lower cost. This model has noise cancelling as standard as well as wideband audio and an adjustable boom microphone. It gives a very good sound quality and is extremely comfortable. The Defero headset from the Avalle stable is designed and manufactured in the UK and represents a very low cost alternative to the more 'established' manufacturers. 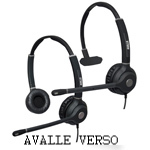 It is available with a standard headset lead as well as USB making it perfect for the professional using a Lync or Unified Communications system. The quick disconnect gives the operator the freedom to leave their desk space without having to remove the headset. The Avalle Verso headset is, most certainly what can only be classed as a ground breaking concept in headset design. The Verso has all the quality and design finish of the models above but can be quickly and easily converted from binaural to monaural and back. This means that a single operator can own two headsets in one and interchange wearing styles dependent upon the conditions. This is all sold as a single unit.